In my research, I found that monastaries throughout Europe in the Middle Ages were dedicated to feeding the poor, taking care of the sick, and providing education to their local communities. These efforts inspired the creation of Luminary Quarter: a monastic brewery and bakery that serves the community. All profits from beer sales contribute directly to the upkeep of the brewery and to the production of bread at the bakery. The baking process incorporates ingredients from the beers (such as spent yeast and excess wheat and barley) so nothing goes to waste. Carrying on the tradition of the monasteries, the bakery would make weekly deliveries to food pantries throughout the New Orleans Community. The topic of focus in this project was the idea of dissent. I chose to spotlight the overthrow of the Apartheid movement in South Africa. Apartheid as an official government policy of racial segregation in South Africa that began in the 20th century. The movement cruelly and forcibly separated people, and had a fearsome state apparatus to punish those who fought against it. In this project I traced the important political and social events in South Africa that shaped, supported and ultimately led to the demise of Apartheid. The design challenge was to create and brand an educational exhibition on the history and timeline of the Apartheid movement in South Africa for a US audience. The invitation to the opening of this exhibition would be one of 27 different matchboxes who’s visuals are inspired by specific turning points on the timeline. The use of matchboxes and the number was inspired by Nelson Mandela’s use of them as a covert communication tool during his imprisonment on Robben Island. He and his fellow prisoners would fashion false bottoms in the matchboxes to secretly exchange information. 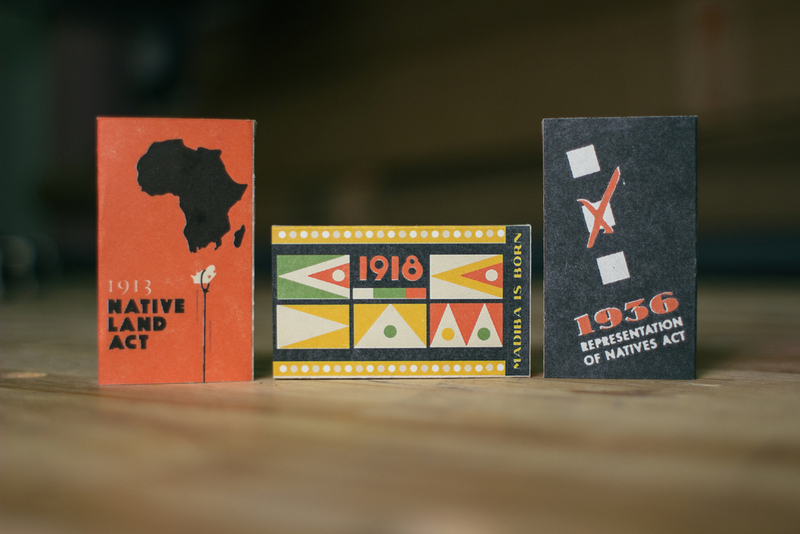 These matchboxes symbolize the spirit of all who resisted the Apartheid movement and fought to keep the spark of hope alive.